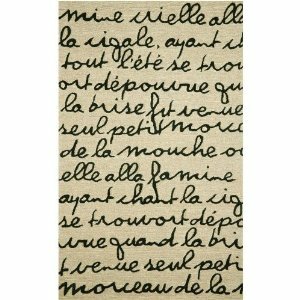 The Poetry Outdoor Rug will bring a little French culture to your deck, patio or outdoor area. The writing in a cursive, or handwriting style font, gives an olde world romantic feel to this contemporary, almost urban, design giving it the versatility to compliment a broad range of design schemes. 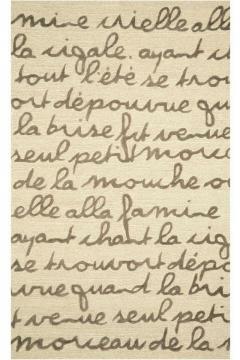 The rug is available with either black or brown text (see below) on a neutral background. While this rug was designed to withstand the rigors of outdoor use , it does not look or feel like a rug that has been designed for the outdoors. What I mean by this is that, while it is made from easy to clean, synthetic fibers, it still has all the richness in look and feel, that you would expect from an indoor rug. It will, in fact, look very much in place, should you choose to use it in your home instead of outdoors, as many people do. It will look as well in an entrance hall, dining room or a living room as it will on your patio. I particularly like this aspect of this rug as it provides you with options to make alternative use out of it, if you decide to redecorate in the future.